Every single birth story is different but every birth is special and beautiful! I have been sharing some of my patient’s birth stories on my Well Mama Instagram page so follow that and check it out if you haven’t yet. Today in honor of my daughter Blakely’s first birthday I am sharing my birth story with you. 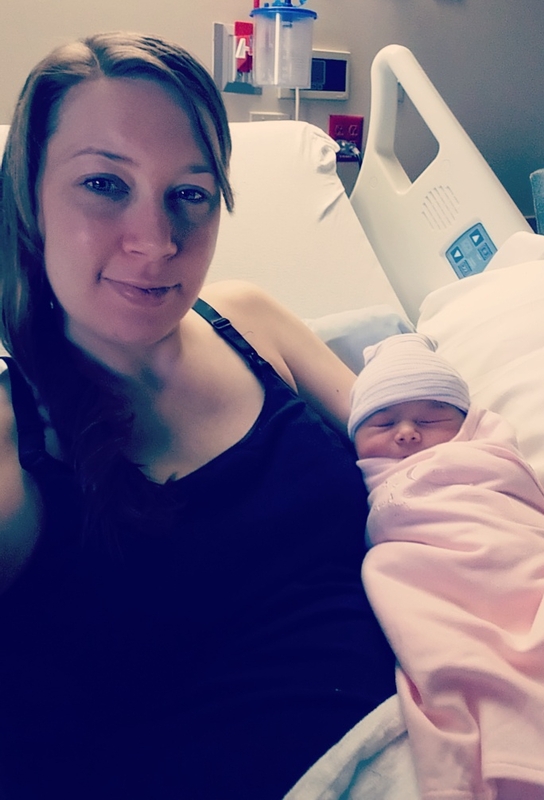 At the end of my first pregnancy, I developed a condition called pre-eclampsia and a complication know as HELLP syndrome. Because of my previous history, I was considered “high risk” during my second pregnancy and I went to a Maternal Fetal Medicine Specialist. He felt strongly that if I made it to 39 weeks and didn’t have the baby by then that I should be induced due to the sudden and severe onset of my condition the first time. I wanted more than anything for the baby to come on its own. By 38 weeks and 1 day there was still no sign of baby Winarski so we scheduled an appointment for induction at 12:00 am Monday, March 26, 2018. I woke up with back pain and some cramping. It seemed to be coming and going roughly every 15-20 minutes but, I had done a workout and walked a lot the day before (shout out to the Love Our Community Egg Hunt) so I figured I just needed some water and rest. I drank some water and laid in bed for a few more hours. I was unsuccessful at getting much sleep because I couldn’t find a comfortable position so I got up. I remember craving an omelette for breakfast but thinking we had a lot of stuff to get done. I wanted to do some last minute cleaning and get a nap before I went into the hospital. Instead, I had some eggs and a smoothie for breakfast, showered and got dressed and ready for the day. Meanwhile, I was still getting an annoying ache coming and going in my back. We had made arrangements for my daughter to have a sleepover with her cousins while we were at the hospital. I was going in to be induced that night. We started our 40 minute drive at around noon. I started to notice the lower back pain getting stronger and coming at about 5-6 minutes interval. It still wasn’t intense but I was concerned because it was coming regularly and often. I finally said to my husband, “I’m not sure but I think I might be in labor.” I called my cousin to tell him we were on our way but it may be a short visit for us… just dropping off our daughter because I might be in labor. Then I called my OB. I said “I’m not sure if I’m really in labor or this is a false alarm but I’ve been having some pain on and off all morning and it’s getting closer together and stronger. Should I wait it out until this evening or come in earlier?” I explained we needed to drop off my daughter and then it was another 45 minute drive from my cousin’s house to the hospital. The doctor suggested I could come in early to check if I really was in labor or if I was feeling alright I could wait it out. I decided we would go to the hospital early. I assumed they wouldn’t send me home at this point even if the labor was false because I was supposed to come back in less than 12 hours anyways. We proceeded to then drop our daughter off. I was very hungry, as usual. We grabbed a Little Caesar’s hot and ready pizza. My husband and I shared it on the way to the hospital and arrived at about 2:00 pm. This next time period feels a bit of a blur because this is where everything started happening so quickly. I knew now for sure that I was in labor. It took about 20-30 minutes for them get me set up in the labor and delivery room and immediately my contractions started getting more intense. I could tell these were contractions and not a back ache anymore. They were getting stronger and painful! Ideally, I wanted to go with no pain meds. I thought to myself: 1) I am only 3cm dilated at this point (I thought but in hindsight probably not true at all) and 2) I would go as long as I could but if I needed the meds no shame I would take an epidural. My husband returned to the room and the epidural was still not working, my doctor was not there yet, and I was 10cm and ready to push! The nurse told me to hang on for a few minutes…. and I quote, “We aren’t going to move your legs at all because I don’t want the baby to just fall out.” My doctor arrived shortly after and Blakely Elizabeth made her way into this world at 5:22pm with only three pushes! I wish I hadn’t gotten the epidural pain meds. If I would have known I was going to progress so quickly and that I was already dilated much further than 3cm, I know that I would have been okay without it! Blakely would have been born faster if I hadn’t waited for my doctor but it was really important to me that he was there for moral support given my previous history. If I have any more babies, I’m nervous how quickly they might come. I was able to eat dinner and never miss a meal at all that day. Blakely has been such a joy and a blessing in my life this past year. My pregnancy and delivery with her was healing for me both physically and emotionally. I’m so happy I get to be her mom!